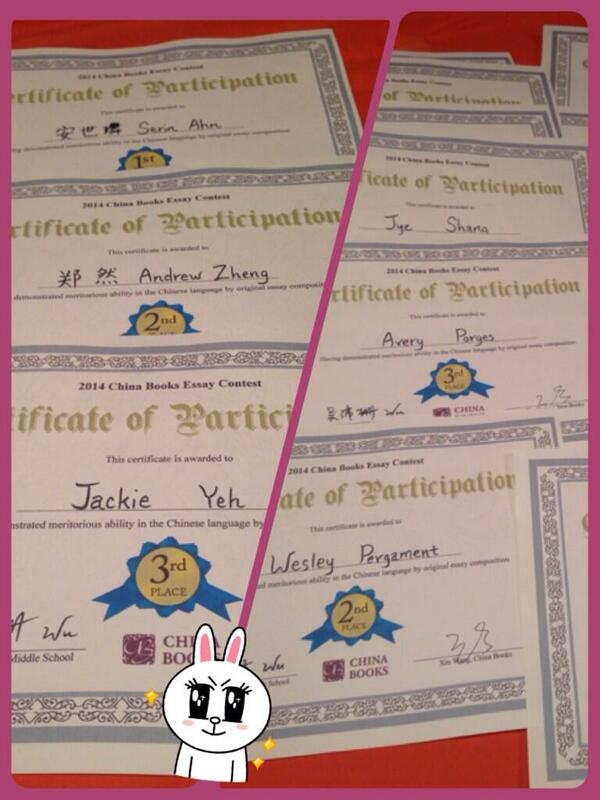 We are excited to announce that the First Annual China Books Essay Contest has officially come to an end! We would like to thank Wu Laoshi at Jericho Middle School in Jericho, NY and her wonderful students for their cooperation in putting this event together. We could not have done it without you! We at China Books were very impressed by the quality of each and every essay and it was incredibly difficult to choose a top three for each of the two participating classes. Students exhibited an impressive understanding of basic Chinese grammar and vocabulary. Essays were judged based on clarity, depth and overall cohesiveness. Click on the names of the students to check out their work! For teachers, school administrators or parents interested in participating next next year’s essay contest, please contact Robert at robertkoeze@sinomediausa.com for more information. Thanks!